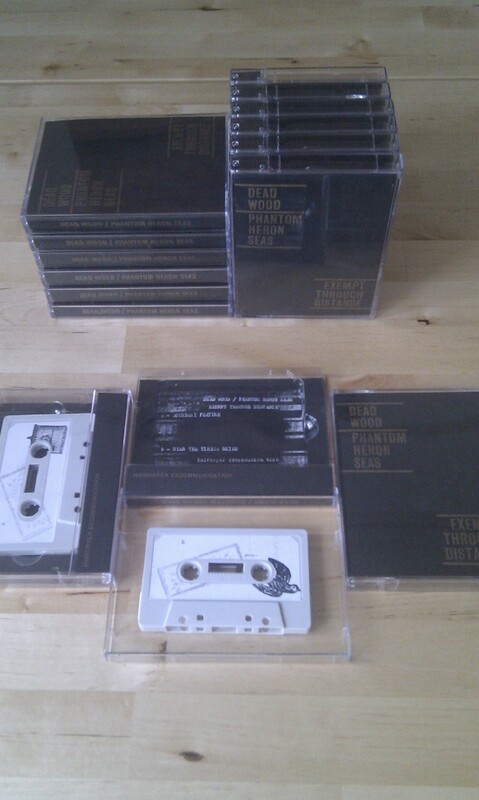 After a string of delays, we can now offer the amazing new release from the on-going collaboration between Dead Wood (Adam Baker, who runs the amazing Dirty Demos and Amps Against Trend labels) and Phantom Heron Seas (Allan Upton, who operates the ever reliable Dead Sea Liner label amongst other projects) in an edition of thirty copies. A weird blend of organic and inorganic matter immerse these two sides of tape. One from inside the shed, and one from outside of the shed? Who knows? Nature running through the radio static of the south coast? The grass feedback to the wind farms? All hand dubbed at home in stereo and served in oversized case with hand stamped labels and a superb letterpress cover by The Print Project from over in Bradford bring together this beautiful oddity. Due to the extra costs on this one, it is going to cost (gulp) £4, and with an extra 75p for UK postage, which I can only apologise for! Don’t worry though, we’re still not not breaking even on this, as that would just be daft.